SILALIVE SILICA breathes new life into a whole-body health approach supporting systemic detoxification & cellular regeneration. SILICA's vital biological role as an activator & stimulator helps improve natural beauty qualities; skin, hair, nails, bones and provides an internal cleansing, scrubbing, flushing sensation! Due to an extremely high demand we can not keep our Grand-Opening Prices available forever! HURRY, Act Now! The world's first-ever super-charged proprietary complex of trace minerals Human-Grade Diatomaceous Earth (85% Silica) + Living Organic Silica supplement to energetically carry-out natural-healing regeneration processes straight from Mother Nature. DE originates from ancient fossilized algae to synergistically blend with highly beneficial Orthosilicic Acid. SilaLive's higher purpose is to Enlighten the Mind + Empower the Body as we invite you to Think→Feel→Become→SilALIVE inside. Health is a natural state of being; highly-electric and dynamic, total body wellness is dependent upon a complete self-sustaining, regulating and functioning system provided an optimal internal environment. Aligning with the animating principles of life-long super health, our sole intention is to replenish wholeness and restore balance within. Human-Grade D.E. (SILICA) is known for its superior ability to aid in cellular-regeneration activity and systemic detoxification pathway stimulation which allows for the removal and elimination of excess metabolic waste, environmental toxins, weight & digestive problems & much more. How might Silica, an ancient treasure for modern health, be the forgotten nutrient? Does it act as an innate biological activator + cellular stimulator? Found so universally abundant in all living processes, can the Silica mineral be the secret to jumpstart natural healing and elimination mechanisms to regain and revitalize whole-body symmetry (no pain or stiffness, low inflammation, balanced hormones, calm nervous system)? Detoxification is HARD. But, it doesn't have to be. In order for the body's self-cleansing sensors to effectively begin to work and release, the right internal settings and conditions must be properly-supplied. Vividly imagine an "internal paradise = external reflection" image. Safely said, detoxification + cleansing are must-do top priorities for the fastest way to open up the flushing and releasing of stagnated foods, coagulated blood debree, excess metabolic waste, environmental toxins, pollutants, free radicals and a host more. The time is now for you to begin cleaning out and replacing with quality life-force nutrition back into your body for whole-body revitalization! You are what you eat, drink, breathe, think, say and do! 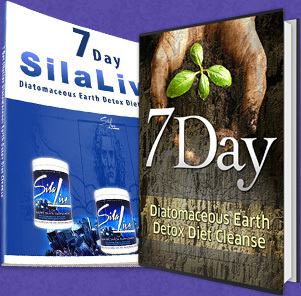 SILALIVE Silica Supplement is a powerful and effective All-Natural Proprietary Complex Blend of Pure Human-Grade Diatomaceous Earth Powder & Organic Silica for Fast Acting Results. 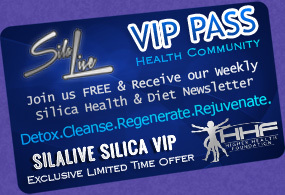 Silalive is 100% Non-Toxic and Safe for Long Term daily use! Make a Committment to Regain Your Health. Take Action & Decide Right Now. We are so confident in your purchase of SilaLive Silica Supplement that we are fulfilling a promise of Lifetime 100% Satisfaction Guarantee on all orders so you can try it risk free and experience the results yourself! Don't forget about your family!